Remove giblets and neck from turkey; reserve for gravy. Blot turkey dry with clean paper towels. Sprinkle salt and pepper in the cavities of the bird. Insert orange wedges into both cavities. Fold neck skin and fasten to the back with skewers. Fold the wings under the back of the turkey. Return legs to tucked position. Place turkey, breast side up, on a rack in a large shallow (no more than 2 1/2-inches deep) roasting pan. Insert an oven-safe thermometer into thickest part of the thigh, being careful it does not touch the bone. Roast turkey in a preheated 325°F (160°C) oven about 3 3/4 hours. Baste with the pan juices. Meanwhile, in a small saucepan, over low heat, combine preserves, bourbon and orange liquid. Cook until preserves are melted. During the last 30 minutes of roasting time, baste the bird with the Bourbon-Peach glaze. Continue to roast until the thermometer registers 180°F (85°C) in the thigh and 170°F (80°C) in the breast. 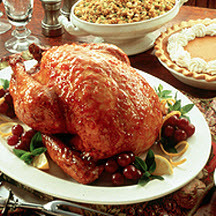 Remove turkey from the oven, remove the orange wedges and allow the bird to rest for 15 to 20 minutes before carving. Place on a warm large platter and garnish with pickled peaches, if desired.